With the upgrade to our suspension and coils and a simultaneous axle overhaul, timing belt change, and fitting of new brake pads, calipers, and lines as well as slightly larger tires I had a few questions about post upgrade performance. Basically, the top-end speed power of the Cruiser felt less than it was before, and braking performance was not great. I had some ideas, but they all came from previous work on cars and lighter trucks I had owned in the past. I had never done any upgrades to any of my other vehicles so I didn’t want to assume anything. 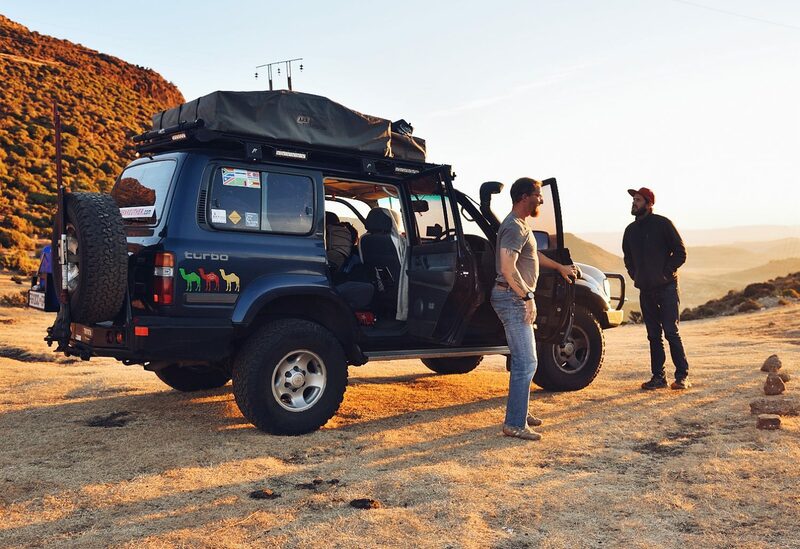 I virtually headed over to the forums of the European Land Cruiser Owners Clubs (LCCE) and Land Cruiser Club Southern Africa (LCCSA) and posted my concerns in threads on each site. The help received was great, and while there were many opinions, none of them were conflicting. Shalk du Toit on the LCCSA site made an interesting point about the axle overhaul. There is a preload on the pinion bearings and the wheel bearings that will rob power until it eases up. Jos Harthog (LCCSA) also pointed out that the lift would change the aerodynamic characteristics of the vehicle, stealing high-end power as well. Eveans Mike (LCCSA) shared that he too had just changed his tire size from 265 to 285 and he noticed he had lost power on hills as I had. When talking brake performance, Jon Wildsmith from LCCE brought up the brake-proportioning valve. “Did he adjust the proportioning valve for the rear brakes? On an 80 there is a load-sensing valve that varies how much work the back brakes do depending on load. With the suspension raised and the valve not adjusted there will be very little work being done by the back brakes and they will be rubbish! You’d be surprised how much difference having that valve set right can make.” I began to read about the valve and ask more questions. Roger Fairclough and grantw, both of LCCE, gave some road test advice to figure out if the rear brakes were doing work. One test involves finding a straight stretch of road and clamping the front brakes, rolling, then pressing the pedal to see if the rear brakes engage. I didn’t have anything to clamp with, or much space so I opted for the rear-rolling test. Drive backwards, hit the brakes and feel if the rear brakes engage and rock the vehicle backwards. It seemed to work and as the days went by braking got better, so most likely the pads just needed to bed in. If the valve had not been adjusted properly there are a multitude of ways to set it properly, so rather than stealing the glory for such knowledge I will refer you to the pages that have been created to cover this topic in detail. Roger Fairclough (LCCE) seems to have an in-depth knowledge of the topic and referred me to the Toyota Shop Manuals, as well as Paul (LCCE) whom referred me to the following page to learn – here. I wanted to read what Toyota had to say, but had not been able to find the shop manuals anywhere online. Jon Wildsmith (LCCE) came through, and posted links, not to where I could buy them, but to the manuals themselves in .pdf format. What a score! I am going to refer you to the Land Cruiser Club of Europe if you wish to download them yourself. While you’re there, check out the threads mentioned. Jaco Denkema, Grahame Burchell, Evert J Möller, Louis Fourie, Coen van Wyk all provided information on calculating fuel needs, the things to watch for driving in Africa, diesel pre-filters, extra parts and gear, testing fuel for paraffin wax, spots, bull-bars, snorkels, security, Loctite, and many other topics with numerous links. Rather than rewriting in my own words, I would like or you to go to the websites, giving them support, as they supported me. In addition to the forums, grantw from LCCE recommended Chris Scott’s “Overlanders’ Handbook”. I had recently purchased and begun to read his other title “Morocco Overland” and found it well written, so I figured the newly recommended book would be worth the purchase. It was. Chris Scott “cycled the Himalaya and Hindu Kush, kayaked off the West Australian Coast, pack-rafted in Scotland, France and Utah, and motorcycled across the Sahara where he has also travelled by bush taxi, truck, 4×4, and camel caravan.” The “Overlanders’ Handbook” covers Planning and Preparation, Choosing a Vehicle, 4x4s, Modifying Your Vehicle, Converting a Vehicle, Building a Cabin, Driving Overland, Life on the Road, and route outlines for Asia, Africa, and Latin America. While Chris Scott is the author, there are contributions by 47 other adventurists, including Notes from the Road. When I consider reading a book that is meant to assist me with an endeavor I like to consider the referring source and the author and contributors backgrounds. I’m not much for theory when it comes to implementing advice. I prefer experience. Both the author and contributors have actually planned a trip, bought, modified, and outfit their vehicles, and successfully completed their journeys whilst having the discipline to document all of it. This is not an easy task. Ours on rough terrain can wear your body out as hours on your feet can. It takes discipline and work ethic toe sit down and write out your thoughts, events that occurred, and then to analyze them to make self-improvement suggestions for the next trip. I find this book both very informative, and well written. I highly recommend it if you plan on doing an overland adventure. I will save you some headaches.